If you've ever struggled to get briquettes to light, a pellet grill could be an ideal addition to your outdoor kitchen. 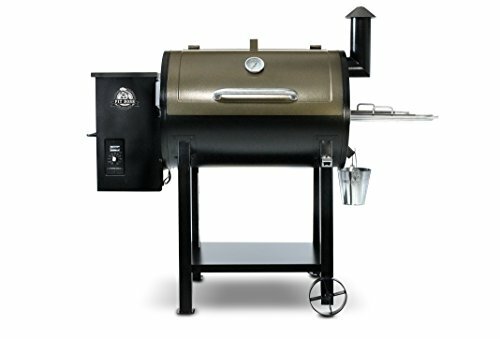 The Pit Boss 820 Deluxe offers barbecue fans the chance for smoky barbecue flavor without the hassle of handling briquettes. You simply plug in the unit, add pellets to the hopper, and let the auger feed the fire. This unit features an adjustable heat shield for direct and indirect cooking, so you can flame broil or use it as an oven! The Pit Boss 72820 Deluxe Wood Pellet Grill uses pellets rather than charcoal briquettes as a heat source. To get the pellets to burn, they must be poured into the hopper so the mechanism can turn, feeding the pellets to the fire. Consistent working of the pellet auger is critical to a consistent heat source and reliable fire. The condition of your pellets is critical. While barbecue pellets can't become stale in the traditional sense, they may absorb moisture over time, which will limit their ability to burn at low temperatures. As possible, store your pellets in an airtight environment. Hardwood pellets are expensive, but offer great flavor and a consistent burn. Cheaper pellets are available; however, cheap grilling pellets are loaded with fillers and will cause a nasty ash build-up in your grill. Once your pellets are loaded and burning, you can control the heat of this grill with a simple dial. The grill does feature a thermometer display in the lid of the grill which can help you determine the ambient temperature, but it's important to use a good meat thermometer to confirm meat products have reached a safe temperature. The 72820 Pit Boss Pellet Grill Deluxe comes with trays that fit into the bracket at the right hand side of the grill. These trays are great for transport, but you'll need to do your prep work elsewhere; the food trays are stainless steel and aren't a great space for cutting. One of the frustrations for many who try to use briquettes is trying to determine the proper time to start cooking. If you fight to light the briquettes, you may start your food too early when the fire does more incinerating than cooking, but if you wait too long cooking takes forever or never finishes. The 72820 Deluxe Pellet Grill avoids this hassle with the temperature dial. While flame-grilled steaks and burgers are delicious, many foods don't tolerate direct exposure to fire. By adjust the heat shield, you can cook more delicate products indirectly while your steak sizzles. The pellet hopper is nice and high so adding pellets while the grill is working will keep you from bending near the flames. Always follow the manual instructions when working near an active auger or a hot grill. Grilling should be fun and relaxing, so kick back a little and enjoy! The bottom shelf serves a dual purpose. It may give you a spot to store a bin of grilling utensils or other necessary tools. Additionally, this shelf stabilizes your grill legs so moving the grill into position is safe and easy. No Pit Boss 820 review would be complete without discussing the hopper challenges inherent in pellet grilling and some of the specific problems faced by those using a pellet grill. Pellets are fed into the fire by an auger, and augers must turn and church the pellets to create a controlled burn. If the auger is not functioning well or properly secured, fire delivery and thus heat will be erratic and the grill will not work properly. Some users have found the plastic wheels to be insufficient for their needs, or felt they should be under the hopper and not the prep tray. There is a sturdy handle at the hopper end that makes it easy to maneuver this grill as designed. Many factors can impact the accuracy of the thermometer in the lid, including wind and humidity. Any time you're handling raw meat, you need to use a quality meat thermometer with a probe to confirm a safe cooking temperature. You will need to plug this unit in to power for the auger and heat source to work, so be prepared to run power out to your patio if you don't have an outlet. The 72820 Deluxe Wood Pellet Grill gives those who love the taste and smell of woodsmoke a safe and convenient cooking option. This grill gives backyard chefs a portable oven with smoking capabilities, and your pellet choice can expand your flavor options. What do you think? Let us know in the comments with your thoughts and experiences with the Pit Boss 820 Pellet Grill or similar Pit Boss grills.